Do you think having a retirement income is overrated? Do you ever look at those poor suckers who are getting sunburnt in their hammocks on the beach, when they could be working a retail job at the age of 70? If you have zero interest in saving money and building a future for yourself in your elder years, keep reading, because there are plenty of creative things you can do to ensure that you won’t have a penny to your name when you’re in your old age. If you had all kinds of money in savings that you don’t intend to ever use when you’re retired, you’re in luck — one way to quickly drain your bank account is to pick up a heavy gambling habit! Is there a chance that you could win something? Sure, but fortunately, if your intent is to lose money, gambling is a great way because the house always wins and the odds are deliberately stacked up against you. Casinos prey on people with large fortunes who lack the impetus to show some self-restraint, so that nice nest egg of yours will be gone in no time. This one makes it all too easy — you won’t need retirement money if you’re in prison, right? You can cut out the stress of money altogether by doing something so tremendously crazy and risky as robbing a bank. Sure, you could break into their vault, extort their cash, and make off with millions, but the much more likely option is that you don’t get away with it and you end up in a nice cozy cell for the foreseeable future. Conventional wisdom says that you should own your property, as soon as is realistically possible. But that’s for people who might want to save money, not spend it. Indeed, want a surefire way to ensure that you won’t be able to cash in on equity that you’ve built up over the years? Avoid it entirely by renting your whole life! None of your money will ever come back to you, and you’ll be able to enjoy paying a higher price for less space, more restriction, and zero equity. 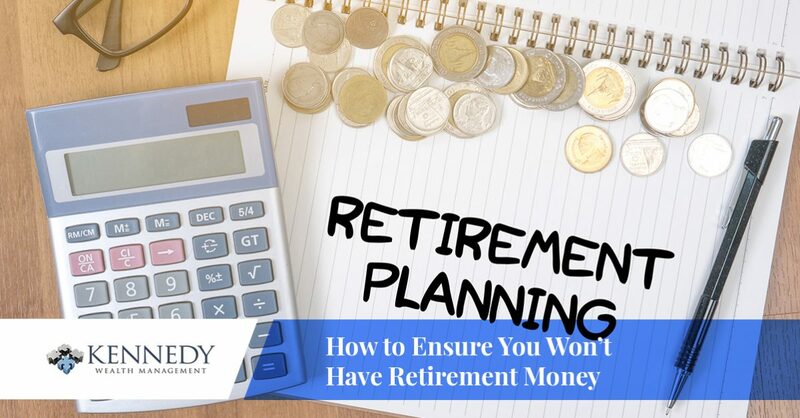 While income professionals and well-read businessmen might encourage you to make safe investments that have a reasonable probability of return, things are a lot easier if you’re not planning on having any money in the future! So if you want to drain your life savings faster than you can say “Enron,” try investing in volatile, high-risk companies. Investments, of course, don’t need to be made exclusively in the stock market if you don’t want to have any money saved up when you’re old. Got a friend who’s asking $200,000 of investment money for his business idea that he claims is infallible? Fund the whole thing! The ideas we’ve listed above are pretty great, but you might be asking yourself, “what if I actually do want to have money when I’m retired?” A silly question, to be sure, but there is one way you can make sure you have a healthy, prosperous retirement income when you’re older — by calling your local financial advisors. That’s exactly what we do at Kennedy Wealth Management; we have helped hundreds of clients to ensure that they have a healthy fund waiting for them in their retirement years, and we want to help you too. While we wrote this blog post tongue-in-cheek, the reality is that far too many people find easy ways to drain their money when it could be saved to build for a much brighter future. Don’t make the mistakes we’ve listed above, or do anything else that could jeopardize your retirement years. It’s becoming harder and harder for the average worker to build up a solid retirement income plan, so get ahead of the problem by meeting with us at our Calabasas location today. We want to help you to have the happiest life you can have in your elder years, and it all starts by giving us a call.